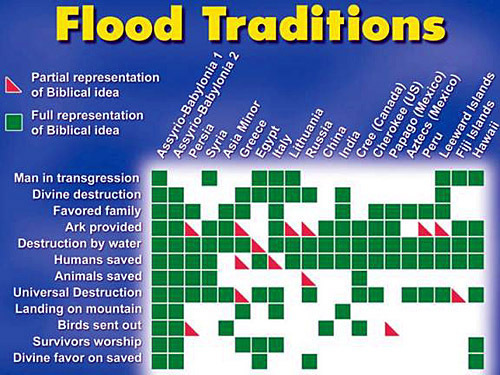 One good line of evidence for a global flood are the global flood legends. Groups of earths ancients people’s [ all stemming from Noah’s family ] have stories uncannily similar to the Genesis record. Why? Because it happened. The most logical explanation is that they all knew the story; as Noah and his family would have drilled it into the minds of all the kids and grandkids for several generations. Yet, as time passed, “rebels” to Gods truths and laws emerged. How many of you know good Christain families with rebellious children? The sinful heart is exposed quickly. These kids took off and started the pagan nations. But they still remembered and taught the flood of Noah oddly enough. It must have been very well impressed into their minds. This is why we have the stories today. It’s the same thing can be said about the so called “dinosaurs”. We have legends of terrible beast of all strips, not proof of anything, in of its self, but exactly what we would expect to see if reading Genesis at face value was the correct way to understand it. >>>One simple but powerful evidence that man walked with Dinosaurs that many miss or overlook is simply this. 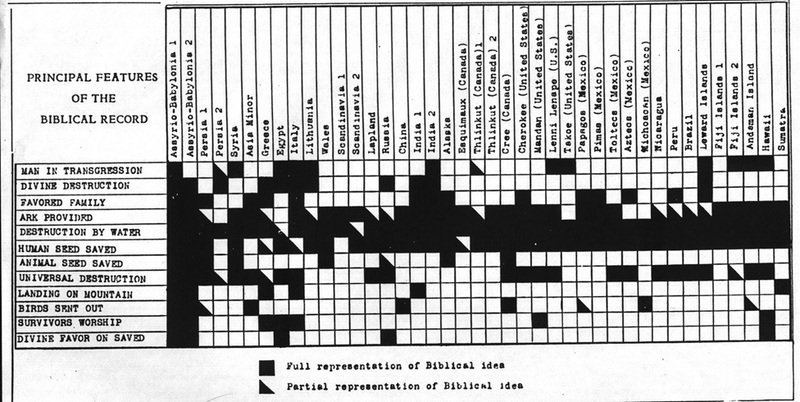 In the Creation sequence (Gen 1) animals were made on the 6th day. ALL the animals. Not just some. Scripture gives no further accounts of another creation sequence of a “separate” kind of animal aka “dinosaurs”. So man being created after this, logically would have seen all the creatures that preceded him, presumingly for naming (Gen. 2:20) This is logical and consistent with the text and also well within the realm of Gods power, no need to question it. God created T-Rex’s, Acrocanthosaurus, Achelousaurus, Gallimimus, the Coelacanth, Racoons, Rabbits and every other creature that walked and swam on the earth. God did and does not believe in “dinosaurs”. These are merely in the minds of men. We clearly walked with these creatures. * We carved caves and artefacts with their images. * We passed down stories about “dragons” and terrifying sea creatures. * The Bible mentions monstrous creatures. * We have “living fossils” of the ones [ “dinosaurs” ] that survived until today. * We have fresh tissue in multiple specimens of “fossils” that somehow survived for millions of years. 24Then God said, “Let the earth bring forth living creatures after their kind: cattle and creeping things and beasts of the earth after their kind”; and it was so. 25God made the beasts of the earth after their kind, and the cattle after their kind, and everything that creeps on the ground after its kind; and God saw that it was good.26Then God said, “Let Us make man in Our image, according to Our likeness; and let them rule over the fish of the sea and over the birds of the sky and over the cattle and over all the earth, and over every creeping thing that creeps on the earth.” 27God created man in His own image, in the image of God He created him; male and female He created them. 28God blessed them; and God said to them, “Be fruitful and multiply, and fill the earth, and subdue it; and rule over the fish of the sea and over the birds of the sky and over every living thing that moves on the earth.” 29Then God said, “Behold, I have given you every plant yielding seed that is on the surface of all the earth, and every tree which has fruit yielding seed; it shall be food for you; 30and to every beast of the earth and to every bird of the sky and to every thing that moves on the earth which has life, I have given every green plant for food”; and it was so. 31God saw all that He had made, and behold, it was very good. And there was evening and there was morning, the sixth day. Post flood the world changed. Some made it; some did not. ← How did Some Fish Survive a Global Flood?